Max was quite obsessive about toys & he would think nothing of digging the base out of the lounge suite to retrieve 'his' toy! However ~ once he'd removed the 'heart' (the squeak), out of a toy he quickly lost interest. He was also the master hunter of all things feathered! I remember coming home one day to find all our chickens neatly piled up on the doorstep! Being a good little Gundog, not only had Max managed (in his mind) to provide food fit for our table, he had also neatly arranged & stacked his conquests ~ all ready for us to cook (for him?)! Needless to say we kept him on a tight rein after that little episode, especially when replacement fowl were purchased! 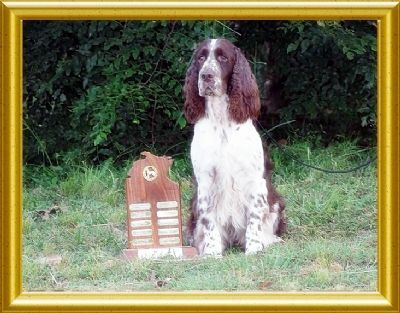 A delight to show & always in great demand as a Junior Handler dog ~ Max has a very special place in the hearts of many. 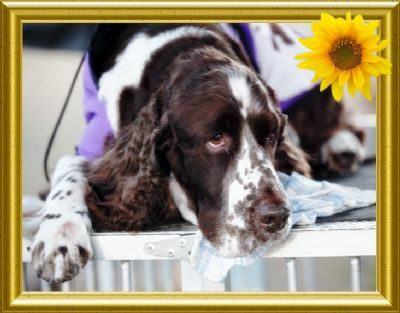 He had cheated death oh so many times; but his last battle just could not be won so, in the arms of his best friend Michelle, he was given his 'wings' in June 2015. Darling Max is now running free over the Rainbow Bridge ~ & it was such a joy to have him in our world.